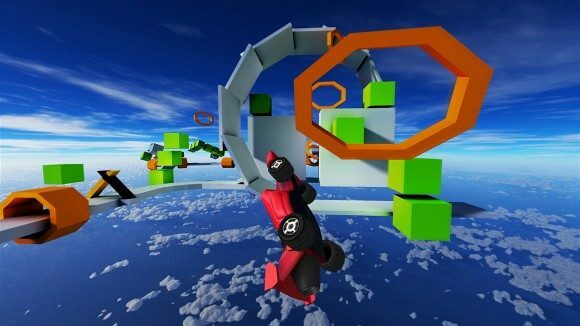 Czech Republic based Indie Developer and Publisher along with True Axis and bitComposer recently released the hybrid game between racing and platformer, Jet Car Stunts, to the Xbox 360, though exciting news for PlayStation owners has been announced. PlayStation 3 and PS Vita users will be getting this new take on a popular racing franchise, this October 7th for North America and October 8th for Europe. There is also news that there will be a PlayStation 4 and Xbox One version for Jet Car Stunts as well, and it will be coming later this year, no dates just yet. Jakub Mikyska, the CEO of Grip Games announced the news on the PlayStation Blog, mentioning that the game will cost $7.99 and yes, the game supports cross-buy. Once the PlayStation 4 version is finally release, it will also include that console. Haven’t read any news about Jet Car Stunts? In Jet Car Stunts, players will experience a ‘high speed, adrenaline-fulled hybrid between a racing game and a platformer.’ This supersonic racing game will get you going, and wanting for more! With the high speed, you want to make sure to make the right move, because if you make a wrong one, as you can see in the picture above, it will lead you straight to death or a head on collision to the environment around you. The vehicle that you drive, a Jet Car, is a vehicle that is a mix between a formula car and a jet plane. When you drive and fly at the same time, you will notice that your car has flaps that will go up in order to control your vehicle more while in the air, in order to either slow down, or move at a certain angle in order to make it back onto the racing track. Jet Car Stunts allows you to race against time, race against other players through an asynchronous multiplayer mode that allows you to see the player you are going against in an almost ghost like experience. Being that you have a Jet-engine-enable car, you don’t just fly or drive fast, you face against obstacles that are placed on the craziest tracks, where you will be going through loops, falls, and mile-long jumps. You will see new cars, game modes, new features and more. You can find out more information and screenshots on Jet Car Stunts/Grip Games official site. You can stay up-to-date with Jet Car Stunts and any games from Grip Games by liking them on Facebook and follow them on Twitter.